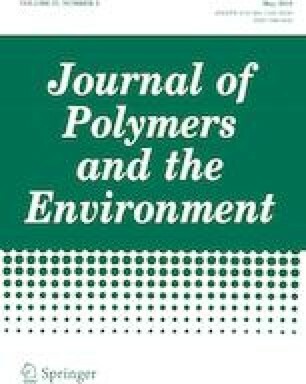 The use of biobased plasticizers with low toxicity and good compatibility with polyvinyl chloride (PVC) has become more attractive in the recent years in contrast with phthalate derivatives. In this study, a glycerol derivative plasticizer (triacetin—TAG) was tested as a secondary plasticizer for PVC. TAG was added to PVC formulations from 10 up to 20 phr. The increase of the plasticizer content had a great influence on the properties of PVC samples. The good miscibility and therefore the efficient plasticization action of the TAG were supported by DMA results, since narrow peaks of tan (δ) curves and reduction of the Tg values for the samples were observed. The ensuing PVC demonstrated good rheological properties and thermal stability up to 200 °C. Finally, the presence of TAG reduces the hardness of materials and does not increase their density. This work is funded by ERDF Funds through Operational Competitiveness Programme—COMPETE in the frame of the project GREENPEC—FCOMP-01-0202-FEDER-34132 and developed in the scope of the project CICECO-Aveiro Institute of Materials (Ref. FCT UID/CTM/50011/2013), financed by national funds through the FCT/MEC and when applicable co-financed by FEDER under the PT2020 Partnership Agreement.